Air Pollution Control Technologies that are Low Cost and Friendly to the Environment! ClearStack Power LLC is developing innovative and cost effective solutions for energy companies to meet current and future air pollution regulations. A front-end pulverized coal boiler retrofit technology that reduces nitrogen oxides, sulfur dioxide, mercury, other heavy metal air toxics, chlorine and fluorine emissions. 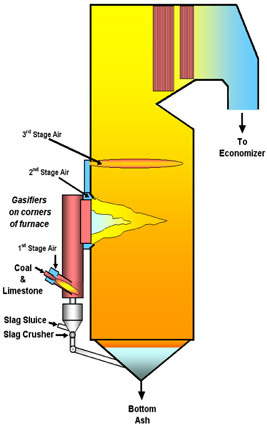 A retrofit technology for coal cyclone-fired units that uses three stages of oxidation to reduce NOX emissions to Selective Catalytic Reduction levels at low capital and operating costs. A back-end dry scrubber that reduces sulfur dioxide and nitrogen oxides and improves electrostatic precipitator performance.